Metro Solid Shelving is available in galvanized and stainless with black epoxy coated corners as well as all-stainless cart washable / autoclavable. 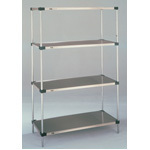 Because solid shelves can be easily adapted as a shelving unit, wire shelves can be combined with solid. Furthermore, a three sided frame can make this into customized work station. Additionally, a raised 1/8” (3.2mm) ship’s edges surrounding the perimeter helps contain spills.